Again our sincere thanks to all our donors ... the Park would not have been possible without your generosity and it belongs to all of you! We recognize some of our most recent donors: Gander Collegiate 50th Anniversary Reunion and the Gander Goodwill Centre for their donations of $1,000 each. This is the Centre's second $1,000 donation. 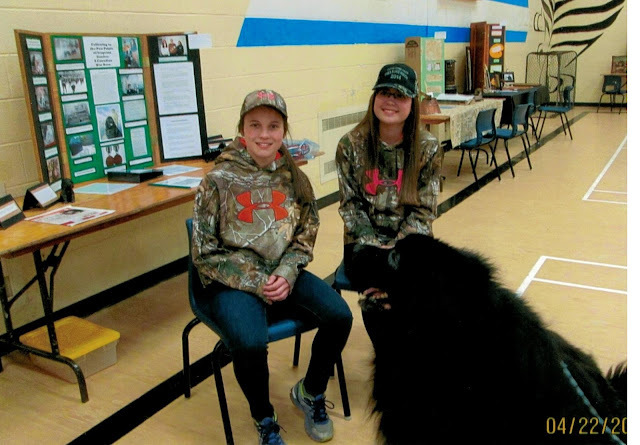 In these photos are Brianna Blake and Madison Baker of Twillingate. A community competition was held in the schools in this district and these young ladies decided to do their Project about Sgt. Gander. They did a lot of research and interviewed Eileen Elms of Gander and got photos of Eileen and Gander in the early days, which they used in their project. 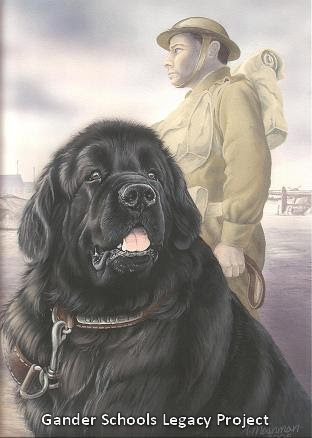 As well they even had a real Newfoundland Dog on hand for the presentation. 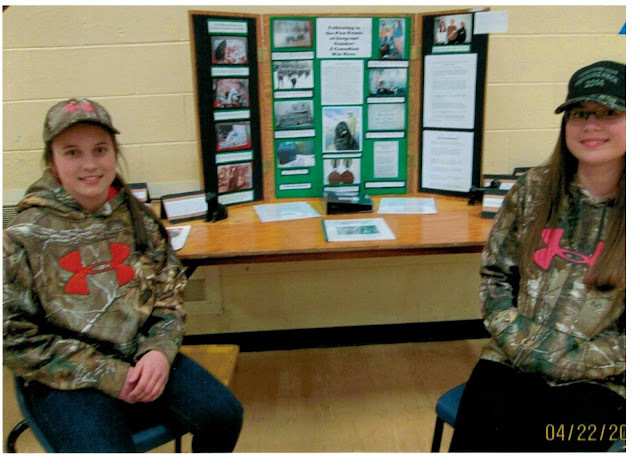 Well, Brianna and Madison won first place in their class and decided to donate their winnings to the Gander Heritage Memorial Park to go towards the monument of Sgt. Gander. That was certainly a wonderful gesture and we thank them so much. We certainly hope they can be present for the unveiling on July 23rd 2015, and we hope many of you can also attend. Again, a big thank you to the Gander Lions Club for a $4,000 donation! This is the Club's second donation for a total of $14,000. Members of the Club gathered at the Park on June 22nd  while President Delores Jones made the presentation to Pat Brazil and Don Stuckless (Lion) of the Park Committee. The Gander Lions Club has been a consistent supporter of the Park and we wish to express our great appreciation to each and every member! We now have an updated Donations page and an updated Donations Progress Bar with an updated Ticker on the right. As of June 23 2015 we have achieved 83.9% of our target which amounts to $453,138 of our target total of $540,000. Thank you to all who have donated your time or financial aid ... much appreciated! On the Donations page I updated sections Small Business Donors and Individual Donors! to jump to the updated Donations page to view all updated sections. You may purchase plaza stones by simply making your donation in the same manner as detailed on this website and then send a short email to Maxine maxine@briggsaero.com denoting that the donation is for the "purchase of paving stone(s)". Receipts for income tax purposes will be issued by the Town of Gander.